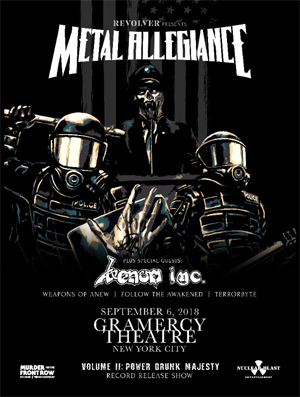 METAL ALLEGIANCE began as a celebration of heavy metal, powered by the almost tribal bond shared between the extreme music community’s most revered trailblazers, armed with a list of contributors onstage (and off) that read like a Wikipedia entry on the genre itself. Their upcoming sophomore album, Volume II - Power Drunk Majesty, will be released on September 7th, 2018 via Nuclear Blast Entertainment. With less than 2 weeks until Volume II - Power Drunk Majesty is released, METAL ALLEGIANCE is offering a third single. Watch the music video for "Bound By Silence" featuring John Bush on KNAC.COM HERE. Pre-order Volume II - Power Drunk Majesty and receive "Voodoo Of The Godsend" and "Mother Of Sin" instantly. In celebration of the release, the band announced a special release show presented by Revolver at The Gramercy in New York on September 6th. In true METAL ALLEGIANCE fashion, the night will include an all-star line-up that will not disappoint! 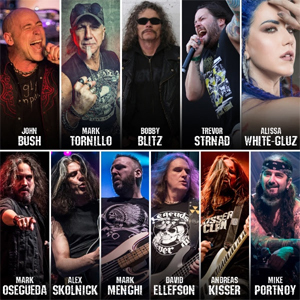 The night will feature the core four - David Ellefson, Alex Skolnick, Mark Menghi, and Mike Portnoy - as well as Mark Osegueda, Andreas Kisser, John Bush and Bobby "Blitz" Ellsworth. The night will also include Trevor Strnad and Mark Tornillo who are making their METAL ALLEGIANCE debut on Volume II - Power Drunk Majesty. Direct support for the show is VENOM INC, WEAPONS OF ANEW, FOLLOW THE AWAKENED and TERRORBYTE. Purchase your VIP package HERE.